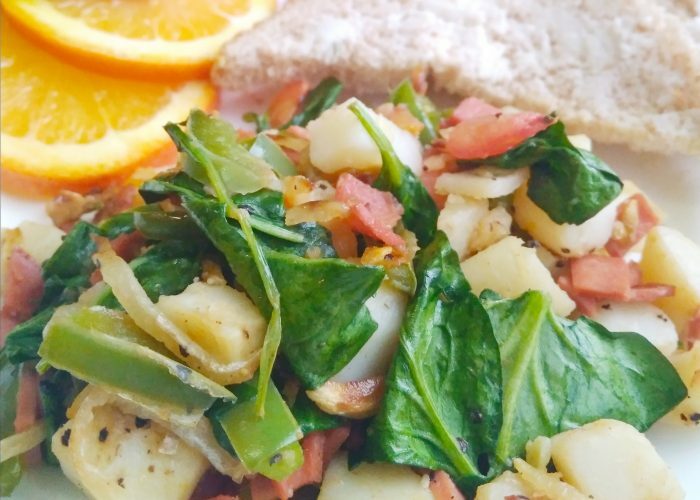 Here is a simple and quick plant-based recipe you can serve your family or guests for a hearty breakfast. It even works great as a lunch or ‘breakfast-for-dinner’ recipe. Pair with toast, bagels, buns, pancakes, waffles, crepes, muffins, your favorite gluten-free alternative or simply with fresh fruit. You can even wrap this up in a tortilla with some ketchup, tahini-ketchup or siracha ketchup to make a tasty breakfast burrito! It should be noted that commercial soy-based lunch meats or soy tofu dog products tend to be made with gluten as part of the ingredients, hence this recipe cannot be called gluten-free. However, if you are able to find an alternative gluten-free meat analog that you can use in this recipe, then this recipe would be gluten-free! Feel free to scale up this vegan, egg-free, dairy-free and nut-free recipe depending on the number you have at the family table. A simple and quick vegan, egg-free, dairy-free and nut-free meal to satisfy vegans and non-vegans. Pair with toast, bagels, pancakes, waffles, crepes or your favorite gluten-free alternative. Heat up 1 tablespoon of oil in a skillet on medium heat. Once the oil is hot, sauté the minced garlic and diced onions in the oil for 2-3 minutes, then add in the chopped soy lunch meat. Let the soy lunch meat cook until browned and slightly crispy (about 5 - 7 minutes), stirring frequently to prevent sticking to the saucepan. Turn down the stove top heat setting slightly if needed. While the soy lunch meat is cooking, cook a large potato in the microwave. To do this, poke some holes in a potato first with a knife or fork and sprinkle some water on the potato. Then heat the potato in a covered microwave-safe dish for 2-3 minutes at a time until cooked through. Remove the potato carefully from the microwave, let cool (or run the potato under cold water). Peel the potato and chop into cubes. If this is not enough to give you 2 cups’ worth of cooked potato cubes, repeat this step to cook another potato in the microwave. Chop up the rest of the ingredients while the potato and soy lunch meat is cooking. Add the potato cubes, bell pepper and the remaining additional ½ tablespoon of olive oil to the pan. Stir frequently for 5 minutes to let the potato chunks brown on most sides. Add in the salt, ground black pepper and Cajun seasonings. Add into the skillet the diced tomato and chopped spinach leaves. Stir and cook for another 3-5 minutes. Taste the dish and adjust the seasonings as desired. Top the hash with some vegan ‘cheese’ shreds (optional) and serve! Notes: If you don't have sliced soy lunch meat on hand, an alternative would be to chop up 3 soy-based tofu dogs (or other plant-protein based meat analog) instead. Feel free to add or substitute other veggies like chopped mushrooms and kale if you don’t have some of the listed ingredients above. Taste and adjust the seasonings before serving to your taste (you may want to add more pepper, Cajun seasoning, or even cayenne pepper for a more spicy kick). Tahini-Ketchup: simply mix one tablespoon of tahini with one tablespoon of ketchup in a 1:1 ratio. For an oil-free recipe, use at least a ¼ cup of vegetable broth (more if needed) in a well heated skillet to sauté the garlic, onions and to cook the rest of the ingredients.